Well it seemed to kick off a bit, barbel wise, this week. But Darren was on holiday, I'd been texting him the results, so this afternoon on his return he was chomping at the bit to get to the river. He asked me if I fancied an evening's fishing, yeah, like I'm going to say no! I was definitely going home at 9.30pm so we fished hard and covered a lot of water. At 11.10pm (in definitely our last swim) I saw his rod making a break for the river - the only bite of the night. Darren was hooked up and had a great fight in the dark. Wasn't until the fish was in the net we saw it was a real whopper, a 10lb 1oz barbel, it doesn't matter if you've sat there half the night, sometimes in the rain if you get a double - well done mate - top fishing! And look who it was, the 10lb 8oz from the 20th August (same set of scales, tested on Wednesday, double checked against Darren's scales tonight). 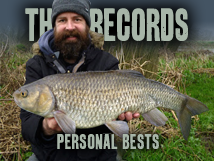 It's been out 4 times this year, twice in February and twice this month, losing weight each time - but it fought like stink and went back well - does anyone know the natural fluctuation in barbel weight? 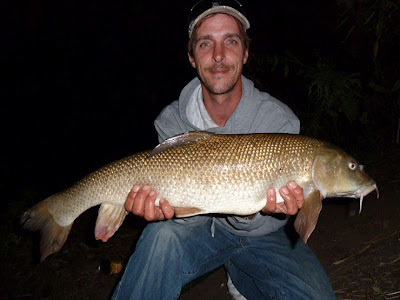 I had a convo with stu in regards to barbel weights and the way they drop and gain weight, if my small study on the barbel is correct, that one shouldn't get caught now for a good few months, she'll hide away somewhere and be caught again towards the back end of the season with about a 1-2 lb extra weight ready for next years spawning session. The biggest I know that one has come out at was 11.12 that I had in feb. Cheers James, got those weights and dates noted, be quite interesting to track the weight of this fish as it's big and distinctive.